Komatsu forklift can solve your hire and rental needs with both short and long term forklift hire available 7 days per week, 24 hours per day. We can provide same-day delivery of hire/rental forklifts in Sydney, Newcastle, Canberra, Wollongong, Melbourne, Adelaide, Perth, Gold Coast, Brisbane, Townsville, Rockhampton and FNQ. As the forklift manufacturer Komatsu understands you want your forklift to work, all the time every time. Every Komatsu Forklift hire and rental forklift is maintained to the manufacturer's recommendation, using genuine Komatsu parts and genuine Komatsu lubricants. That's the Komatsu Way. Komatsu forklift have our entire range of forklifts available for short and long term hire and rental. We have general duty Komatsu 2.5 ton forklifts available in every branch every day for immediate hire from as little as $125 per week*. Quality and reliability are two core values of Komatsu globally; these values are imbedded into Komatsu Forklift Australia. Every Komatsu forklift hire and rental forklift is provided with the Operators Manual, Daily Check List and the full service history is available and maintained in our Computerised Service System. To further support your workplace safety and compliance with the latest WHS Act and Regulations, Komatsu can provide you with a Risk Assessment specific to your machine. A Long Term Rental agreement is not required to be displayed as a liability on your Company's Financial Statements. Rental costs are tax-deductible for your business. 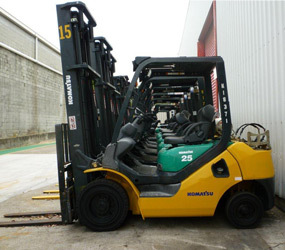 Contact Komatsu Forklift Australia in Sydney, Canberra, Newcastle, Wollongong, Melbourne, Adelaide, Perth, Gold Coast, Brisbane, Townsville, Rockhampton and FNQ for short and long term hire and rental of Komatsu Diesel, LPG, Petrol and Electric counterbalance forklifts. Komatsu forklift hire and rental fleet are available at competitive rates whether for short or long terms. 2.5 ton hire forklifts available at every branch for immediate delivery.